Pop Rewind — Our First Loves: George Jetson and a Mushroom?! Ah, young love. We all remember our first, whether or not they were an already married cartoon character or maybe a fungus. Sometimes first loves don’t really work out so well. In discussing stories for the latest episode of the Pop Rewind Podcast: Strange Things We Believed As Kids, Linz opened up about her first love. If you’ve listened to the podcast, you already get the gist of it, but she’ll retell it here. Lee’s story of his first love, on the other hand, didn’t quite fit in with the podcast topic, but it is something that the world needs to hear. Some girls end up swooning over Disney Princes. I’ve never much had a taste for that, but show me an already married red head (I’m looking at you, Conan O’Brien) and I’m all aboard. 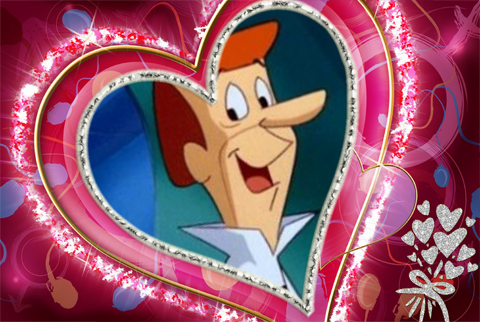 Before I even hit kindergarten, I was totally and completely in love with one man: George Jetson. The Jetsons originally aired from 1962-1963, but then aired again in syndication with new episodes from 1985-1987. I watched it EVERY. DAY. My parents put an old television in my bedroom (maybe not the best parenting move) so I could watch it without bothering them. When I started kindergarten, I went to school in the afternoon meaning I would miss The Jetsons and had a proper meltdown. Either my dad taped it or we found it on at some other time because there’s no way I would have gone to school otherwise. My mother just about lost it. “She’s talking about George Jetson. A cartoon. From The Jetsons.” I provided them with a good laugh that day. Soon after, my mom sat me down and had “the talk” with me. “George Jetson is already married, you can’t marry him.” “Sure I can,” I replied. “What about Jane?” Ever the polygamist (at least at age five): “She can live with us!” “Lindsey, George Jetson is a cartoon. Cartoons are not real.” It was heart-breaking. Honestly, I don’t know if my first love contains any more dignity than Linz’s crush on a Hanna-Barbera cartoon. Back in the late 80s, there was a board game called Pizza Party. The game is made up of four gigantic cardboard pizza slices and prototype POGs are the pizza toppings. Seriously, the size of the pizza pieces would put one of those giant-slice mall pizza places to shame. I still sing this song every time I order a pizza, nearly 20 years later. While the game itself was fun, I was taken by one of the POG-like pieces in particular. In my head, I had developed personalities for each of the four toppings: Pepperoni was the shy one, green pepper was the confidant, onion was the cool one (more like Funyun, amiright? ), and finally there was Miss Mushroom – the most beautiful fungus in all the land… and my first love. We didn’t let the others in on our bond at the time, but it was something special to be sure. I don’t think I even knew what a mushroom was until years later. When I finally had fresh mushrooms as a pizza topping, I felt like our relationship was officially over as I gulped down a slice of the greasy good stuff. You know what? 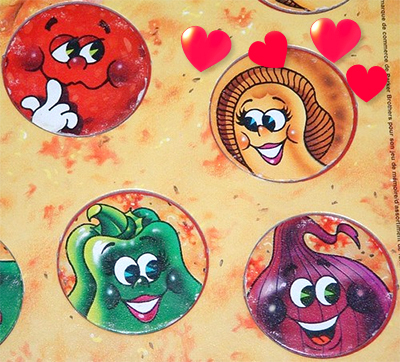 I think George Jetson as a first crush is actually less demeaning than falling for an anthropomorphic pizza topping POG from a short-lived board game. Linz wins this round. Who was your first love? Were they animated? Let us know!